Obama may propose a discretionary spending freeze for three years. Hopefully he’ll fully define what discretionary means; I remember the budget surplus (you know, “extra” money when the country had a trillion dollar debt) so I don’t make any assumptions what politicians in Washington mean by any term that they don’t have a clear track record using. Of course, he’s already exempted the departments of Defense, Homeland Security, and Veterans Affairs (sound like he’s playing to the political right) from the freezes. I think it’s great to implement “new” ideas to reign in government spending — of course I’d like to see some the “old” ideas (you know — those campaign promises Obama made that got him elected) implemented. In the back of my mind I see this a yet another failure looming for the Obama presidency. 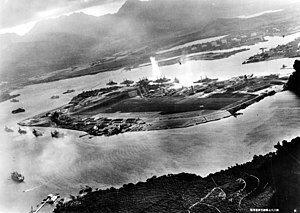 The attack on Pearl Harbor (called the Hawaii Operation or Operation Z by the Japanese Imperial General Headquarters, and the Battle of Pearl Harbor by some Americans) was a surprise military strike conducted by the Imperial Japanese Navy against the United States naval base at Pearl Harbor, Hawaii on the morning of December 7, 1941. The attack was intended as a preventive action in order to keep the U.S. Pacific Fleet from influencing the war that the Empire of Japan was planning in Southeast Asia, against Britain and the Netherlands, as well as the U.S. in the Philippines. The base was attacked by 353 Japanese aircraft in two waves, launched from six aircraft carriers. Four U.S. Navy battleships were sunk (two of which were raised and returned to service later in the war) and the four other battleships present were damaged. The Japanese also sank or damaged three cruisers, three destroyers, an anti-aircraft training ship and one minelayer. 188 U.S. aircraft were destroyed, 2,402 personnel were killed and 1,282 were wounded. The power station, shipyard, maintenance, and fuel and torpedo storage facilities, as well as the submarine piers and headquarters building (also home of the intelligence section) were not attacked. Japanese losses were light, with 29 aircraft and five midget submarines lost, and 65 servicemen killed or wounded. One Japanese sailor was captured. The attack came as a profound shock to the American people and led directly to the United States entry into World War II in both the Pacific and European theaters. The following day ( December 8 ) the United States declared war on Japan. Domestic support for isolationism, which had been strong, disappeared. Clandestine support of Britain (for example the Neutrality Patrol) was replaced by active alliance and full participation in the European Theater. Subsequent operations by the U.S., as well as the Axis alliance, prompted Germany and Italy to declare war on the U.S. on December 11, which was reciprocated by the U.S. the same day. Despite numerous historical precedents for unannounced military action, the lack of any formal warning by Japan, particularly while negotiations were still apparently ongoing, led to President Franklin D. Roosevelt proclaiming December 7, 1941, “a date which will live in infamy”. Let me start by saying this isn’t eBay for dummies — you should familiarize yourself with the basic operation of the eBay web site through another resource. What I hope to provide you with is a rational for how to bid successfully on eBay to enable you to purchase items at a fair price. Let me start by prefixing all of this with the statement that what eBay has tried to do is create the feel of the type of auction commonly refereed to as an “Open Ascending-bid Auction”, also known as an “English Auction” — though they have modified it slightly to have a time limit rather than just go until their are no more bidders. You can read many resources on auction types if you’re interested; there’s actually a body of game-theory that covers auctions for those so inclined. First you need a little background on how eBay’s proxy bidding works, and an understanding that if everyone were to just enter in the actual price they were willing to pay when they first bid that would be all you’d need. What happens on eBay when you enter a bid is fairly simple — eBay records the maximum amount you’re willing to pay for the item, and then will automatically bid as much as needed to satisfy the bid rules. So if there are no bids, eBay will place a bid for you equal to the minimum bid set when the auction was created. If there is already a bid, eBay will place a bid for you equal to the lesser of the maximum you set for your bid or the current amount plus the bid increment (which varies based on the current bid — it increases as the amount of the current bid increases). If two people were to set the same maximum bid, the person who placed the bid first would be the one to have his bid recorded. Like I said, if everyone just entered in what they were really willing to pay then that would be it, and when the auction closed the person who was willing to pay the most would win the auction. But, that’s not how it really works out. You see, people aren’t always honest (even with themselves), and people like to play games (even with themselves), and people always like to get a steal (or read that as great deal if you like)… and of course, people are emotional (so they get caught up on the splendor of the train ride — even when it’s clearly going to wreck). So, what many people do is record a bid for the amount that they’d really like to get the item for — even though they are willing to pay (significantly) more. That means that lots of people are continually upping their bid as they get outbid, and because they see other people “wanting” the item, they get caught up in a frenzy that they often loose control of… and end up paying more than they actually are comfortable with. Remember, no one forces you to keep bidding — and no one forces you to watch the train you’re on slam head on into another (in fact, you’re free to jump off). If you’re head is spinning — or you’re saying that I would never do that (many call that doing the back-stroke in that famous river in Egypt — d-Nile, or denial if you like) then you’re just an average Joe trying to win an auction on eBay. I’m not here to slap anyone on their wrist; if you want entertainment, excitement, need to fill your copious amounts of free time, and don’t mind spending more than you’re comfortable with — by all means, keep getting caught up in the emotions of “winning” a bidding war; but if you’re just looking to get things you want/need at a reasonable price — read on. You could use eBay exactly as it’s designed. Just place an initial bid for exactly what you’re willing to pay for the item and be done with it. Don’t watch the auction, don’t enter in any more bids… be content with your honesty (and do something more useful with your time). But you’re not going to win very many auctions — in fact you’re probably just going to fuel the fire because of the interactions of eBay’s proxy bidding and people who have got caught up in the frenzy of bidding. The answer is easy, you snipe. Basically sniping the auction turns the English Auction into something more resembling a First-Price Sealed-Bid auction (at least from your view point). Wait, what is a snipe? Well, a snipe is a bid placed at the last moment. Sniping basically allows you to place the bid you would have right away at the very end of the auction, giving other bidders no time to respond to your bid — and forcing the eBay proxy system to do it’s job without creating a frenzy of bid-and-re-bid. There’s nothing wrong with sniping; in fact all you’re doing by sniping helping prevent other bidders from getting carried away with bidding. It doesn’t make it any more likely that you’re going to get an item (if there are wild bidders — they may have driven the item up well beyond what you’re willing to pay long before the last few seconds of the auction). And the number one thing it will do for you is prevent you from getting caught up in the bidding war and paying more for an item that you’re interested in. You can bid by hand; just open up the auction; actually open up two copies of the auction, one to watch the count down clock, and in the other enter the maximum amount you’re willing to pay and click to the confirm dialog. When the count down timer reaches under 10 seconds, submit your bid (you may need to submit earlier if you have a slow connection — and you may be able to time it to less than 10 seconds if you have a very fast connect — but remember as long as the amount of time left is less than the reaction time of a human being you’re not going to be fueling the frenzy). Obviously sniping by hand is tedious and time consuming… so there’s automation to help you out. JBidwatcher is a Java based tool that you can run on Windows, OS-X, or Linux desktop (or server) that will attempt to snipe auctions for you from your local machine. Which means you need a stable internet connection and you computer has to be on and JBidwatcher has to be running. It’s totally free, and works fairly well. GIXEN.COM is a web based system. It’s totally free, and works fairly well. There is no limit to the number of auctions you can snipe; but there is a $6 per year upgrade that will give you redundant servers to place your bids (decreasing the chance of not getting you snipe in). There are also a number of other systems that charge — perhaps they’re better, perhaps they’re not… but these two certainly work well enough for you to use to develop an understanding of how to effectively bid on eBay. While I’m giving you the 4-1-1 on sniping, I should mention that there are two basic types of snipes — individual item snipes and group (also called multi) snipes. In an individual item snipe it’s easy to understand — you enter a bid for the item in question and your bid is placed a specified number of seconds before the auction closes. If you have the highest bid at the end you win, if you don’t you don’t — and it’s over and done. In a group snipe you actually bid on a series of items (generally related — but I guess you might also use it for budget constraints). You enter a separate bid for each item of interest in the group. The sniping system will place your bid on the first item — if you win, it cancels all the remaining snipes in the group; if you don’t win, it goes on to the next item in the group. With group snipes you have to be careful that there is sufficient time between the ending time of two auctions for items of interest for the sniping system to handle it (most systems will flag auctions that may be a problem and allow you to decide if you want to take the potential risk of winning both… obviously that’s a bigger deal than missing the second). Also, most sniping systems let you have as many individual snipes or group snipes as you want (you have to be careful not to have the same item in an individual snipe and a group; or in multiple groups). Also, most sniping systems will handle auctions that have multiple items available (in other words, it will place a bid for the amount and quantity — eBay’s proxy bid does most of the work). Sniping might seem like it’s a lot of work; but actually it makes bidding easier in the long run, and more effective. Remember, if you don’t win an auction sniping it’s not (generally) because the sniping system didn’t do it’s job — it’s simply because you weren’t willing to pay as much as someone else… in fact by sniping you’re increasing your chances of winning an auction at the price you’re willing to pay. Let me remind everyone that I am not a fan of eBay / PayPal — I consider them companies of questionable ethics at best. On 2 May 2011 AT&T will implement usage surcharges for their high speed internet services. DSL customer will have 150GB included with their package, and U-Verse customer will have 250 GB included with their package. As I’ve said before, if only 2% of the customer are going to be effected, AT&T wouldn’t take any action — it’s easy to see that AT&T is doing this because they feel this is a way to produce a larger revenue stream for a service they previously advertised and sold to be “unlimited” — so you can view this as nothing short of radically changing the service after the fact, and charging more for less (remember, AT&T just raised their rates). The effect of this type of cap is that if you used your internet service to watch movies, you’d better be careful — you won’t even be able to watch one per day; you’ll have to worry about watching one HD movie every Friday, Saturday, and Sunday. I personally have always felt AT&T was a horrible company, and certainly from my view point it reenforces that view every day with actions like this. Usage examples are estimates based on typical file sizes and/or duration of file transfer or streaming event. And who else can hear me or can see my cellular phone records? Verizon Wireless informed the Obama transition team, the US Secret Service, and law enforcement agencies that a number of Verizon employees had improperly and illegally accessed cellular phone records for a phone belonging to Barrack Obama. The employees have been suspended without pay while the investigation is conducted. So it’s great that a high profile individual like the president elect gets swift action from Verizon, but the question in my mind is why aren’t they just as quick to act when I call? Comcast consistently ranks in the top ten (almost always the top five) of companies with pathetic customer service in virtually every poll I’ve seen (they probably even do poorly in polls they sponsor LOL). I received a unsolicited commercial email from a Comcast business customer; and I did exactly what I should do — report it to the abuse contact published in the ARIN database, and send them a plain text copy of the entire email message — including full headers (adding the word SPAM to the subject). I got back an automated message that said I needed to provide them the headers of the email message and a link to a page that really didn’t have any useful information. I resent the message; including all the tags that were mentioned on the page (including the one for harassment, since that was the closest thing that fit)… and I got back a message from “Fred CSAtech55” referencing case ID NA0000014230535; who tells me if I want to follow up as “Harrassment” (that’s his spelling, not mine) that I should “call Comcast Security Assurance (CSA) at 888-565-4329”; but if I want to follow it up as spam I should “then choose the opt out option that the email provides”. I guess, poor Fred not only can’t spell, but doesn’t understand that the LAST thing you do from an unsolicited email from a company that you’ve never dealt with (and have no reason to trust) is click on one of their links. Maybe if Comcast hired people who could spell they might get out of the top ten worst companies for customer service. Even better, if they hired people with a clue, they might actually be able to provide reasonable customer support and be no where near the top ten worst. Oh, and if you’re thinking that they only provide poor service when you’re not a customer — WRONG, I can tell you story after story about how pathetic their service was in San Francisco; and how much better AT&T’s service was (that should truly be scary, when a company with service as poor as AT&T can have far superior service). For a very long time now I’ve been trying to get my name removed from mailing lists at companies. I’ve tried the DMA do-not-market lists, and the FCC do-not-call lists — as well as the US Postal Service PS-1500 (Application for Prohibitory Order); and while I recommend you try those approaches first, you’re going to find a collection of companies that just believe they can do what they want, and continue to send you mail after you have expressed your desire to have it stopped. Three such companies I’ve found are: Dish Network, DirecTV, and Medicom (a local cable provider). Nothing seems to register with these companies — you can call and be polite, you can call and be abusive — and you will still get mail. Now, though, I have a new tact — and this seems to work. When you receive an advertisement from vendors who just won’t remove you from their mailing list, it likely says something like “Call Now” and provides a number… well, call it. That’s right — call the number; and when they ask why you are calling it, simply politely say because I received an advertisement in my mail box from your company that ask me to — and since I’ve requested a number of times previously to no have anything from your company mailed to me, I can appreciate that it must be very important that I call. Just continue to be polite, tell then you are not interested in their services; don’t answer any personal questions, and continue to remind them that you have repeatedly ask to be removed from their mailing lists, and state that you are convinced that it must be very important that you call, because they continue to send requests for you to call. This will likely go on for awhile, just do it when you have something else to keep you busy (like answer email, write a blog post, etc)… be even toned and polite — don’t say anything, just repeat yourself. If they say they can’t help you and offer another number — remind them that you haven’t ask for anything. You are simply calling in as requested by the mail that they sent you against your wishes. Eventually they will transfer you to a supervisor… and they may in fact transfer you again — but the bottom line is that this is the most effective way I have found to actually get your address and phone numbers removed from their databases. Also, make sure you indicate to them that they do not have your permission to call or mail you… and that you will be happy to call them each and every time you receive a piece of mail from them asking you to do so. You may find that the sales people on the phone will whine to you about they’re just employees trying to make a living… but they are, in fact, part of the problem, and they have the ability to offer you a solution — they just generally will not until you make it clear to them that you will call (as their companies advertisements request). The company could send you an order to stop calling them — but that order has effect only as long as they do not send you another request to call them (an advertisement)… so, bottom line, you will achieve your goal, on your terms. Additionally, I encourage everyone in America to adopt this strategy… if someone keeps sending you mail that you do not want, just call them (like it says to do in the mail) and explain to them that you are calling because they have ask you to — and that you will continue to do that each and every time they mail you; that you have no interest in their services; and have asked on numerous occasions to be removed from their marketing rolls. One last thing — you do not have to provide them with any more information than is on the mailing… so if it doesn’t have you name or your full name — you only need to provide what is on the mailer. If it doesn’t have your phone number, you don’t have to provide it (though remember, when you call a toll free number they always get your caller id — you cannot block it).